I am an animal lover and when this opportunity presented itself, how could I resist? When folks learn of my experience portrayed here, they want to know more. So, here is my story. It was 1972 and I was a factory rep for Dodgen Industries, a manufacturer of recreational vehicles (campers and motorhomes) as well as farm implements that was based in Humboldt, Iowa. We made a line of campers call Born Free. Our logo had a lion jumping over the name. One day, John Dodgen, the President, received a call from some folks in Ames, Iowa who had purchased a lion (we are not sure why) while in New York. 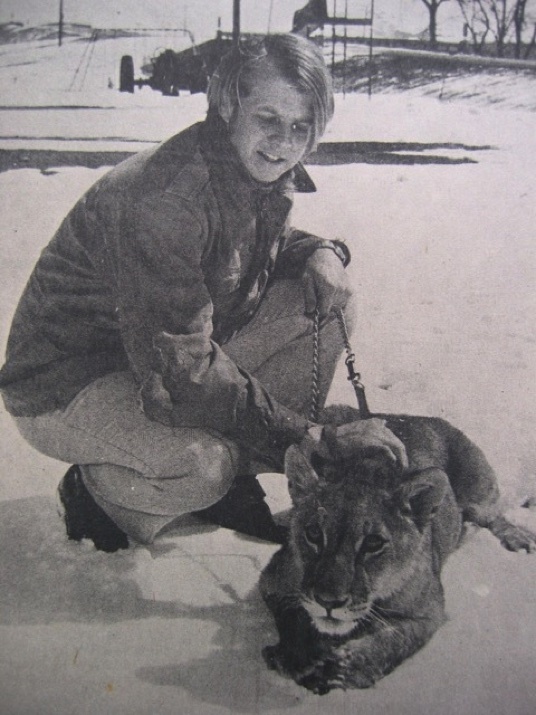 They kept the lion in their subdivision home and she would get outside time by being chained to a stake in their yard. Yes, no surprise. The neighbors took exception to this practice and the authorities were notified. They told the owner they had two choices - get rid of the lion or it would be put down. After calling many zoos and being turned down because the lion had become domesticated the owner was afraid that the lion was going to be put to sleep. Out of ideas, the owner happened to see one of our campers with the lion logo and gave John Dodgen a call explaining basically that he could not find a home for the lion and if John didn't take her then she would have to be put to sleep. 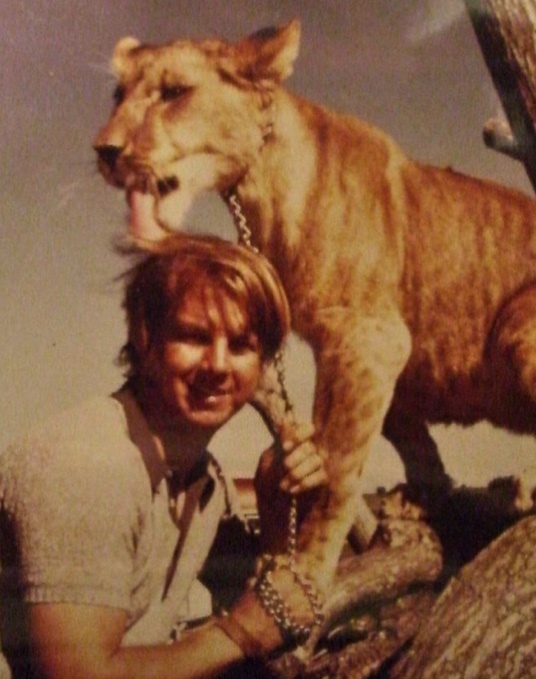 John, also an animal lover, could not let that happen and thought that maybe we could use the lion in promotion of the Born Free in shows and dealer lots. John called me in and explained the situation and ended with "Jim, you will be her caretaker and I would fully understand if you don't want to do this. But, if you don't then she will have to be put down." Thanks John. No pressure there. Fortunately, I do have an adventuresome spirit and surely I didn't want to be the cause of her premature death by turning down the assignment, so I said OK.
We all piled in Johns Cadillac and drove the 90 miles south to Ames, Iowa. A quick transaction was made (As I recall, John gave the folks $100 as a token payment) and we got back in the Cadillac with the lion on a leash and drove back to Humboldt. The lion was named Zaki - by our Sales Manager, Art Gleason who said that was Nigerian word meaning "Most Powerful One" - well, maybe. Art was very creative. No Google at that time. Update: Google / Wikipedia says Zaki is a Persian male name meaning "intelligent". Whoops, her name should have been the female form Zakiya. My wife (at that time) and I traveled all over doing trade shows and dealer lot promotions and we had our own Born Free to travel in. In fact, traveling was the reason we took the assignment to go with Dodgen Industries - we had just graduated from University of Georgia and wanted to travel all over prior to settling down. Our goal was to hit every state (I have now been in 48 of the 50.) And... we had a Chihuahua travel companion. Well, now, we had another travel companion - only much, much larger! We had to head out the next morning to a trade show so the only thing we could do initially was to confine Zaki to the back area of our RV and our dog (a probable tasty morsel) confined to the front area. The four of us lived together in that relatively confined space. It quickly became obvious that this was not going to be a permanent plan. Several weeks later we were able to get back to the factory where a trailer had been constructed especially for her while we were gone. Zaki moved into her new quarters and we hit the road again. One of the first things I learned was that she played just like a regular house cat - only rougher. She liked to (playfully) bite and she had sharp teeth. Hint: If a lion bites you don't pull away as you will have both a puncture and tear wounds. The puncture wounds do not bleed as much. I also learned that she liked to attack my neck from behind. A good defense here is to put your thumb on the outside of her cheek and push her cheek into her teeth. The harder she was biting me, the harder she was biting her cheek. It worked. The first order of business was to figure out what to feed her. Curiously, zoos would not help us with information stating that they didn't think we should have a lion. I said, "Great. We will give her to you." They declined stating they didn't take domesticated felines but still, they would not help us. It was only after running across a UGA classmate at the Atlanta camp show that a solution was at hand. When I learned that he had taken an accounting job with Lion Country Safari in Atlanta, I brought him to our display featuring Zaki. After the show, Rick got us in with their vets for medical evaluation, some shots and a quick course for us on the care and feeding of lions. No, they could not take her but they were very helpful. We were instructed to get ZuPreem - a diet food for exotic felines. Zoos purchased it in large frozen blocks but we were able to buy the canned version (like normal dog food size.) Because we were dealing with an Atlanta distributor, we had to purchase their minimum order - 1,024 cans. Turns out that wasn't a whole lot as she ate 6 cans a day - a six month supply at her initial weight. However, storing a thousand cans in a camper proved to be a challenge. Every cubby hole was full of food! Zaki was a huge draw at the camping shows for both the attendees as well as the press. We always had our display area full of people and Zaki was happy. The press could cover something different and we always got lots of print and TV coverage. While I never could endorse domesticating a wild animal, it was a wonderful experience. It was also very confining as I was her only caretaker and could never be away from her more than 4 hours. Our stage allowed me to successfully turn a lot of folks off the notion of getting a wild animal. I really painted a bleak picture! I have plenty of stories that would take many pages of this website that include Zaki meeting famous people, the fire in her cage, our wild ride in a police car complete with lights and siren, her encounter with Smokey The Bear (at a camping show), a very brief fight with an Irish Wolf Hound (she won), being challenged at a Holiday Inn when our Sales Manager, Art Gleason, had asked for a Lion Bag - yes, I produced her right into their restaurant, a litter box for a lion, the first time she saw the ocean and walked in water and many, many more. One quick story, we were in up state New York and was about to go into Canada. Customs prevented our entry beause we didn't have the right paperwork on our Chihuahua. No papers on Zaki - no problem. Zaki could come in with us but not our dog. Well, as Paul Harvey would say, "The rest of the story" is about a four-beer story. 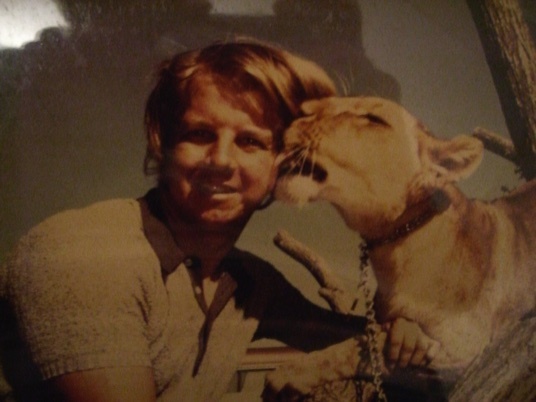 The bottom line for me is I have been up chewed on by a lion, so not many real estate deals scare me.